30-inch 1.5 cu. ft. Built-In Microwave with Drop Down Door in Stainless Steel is rated 4.2 out of 5 by 68. 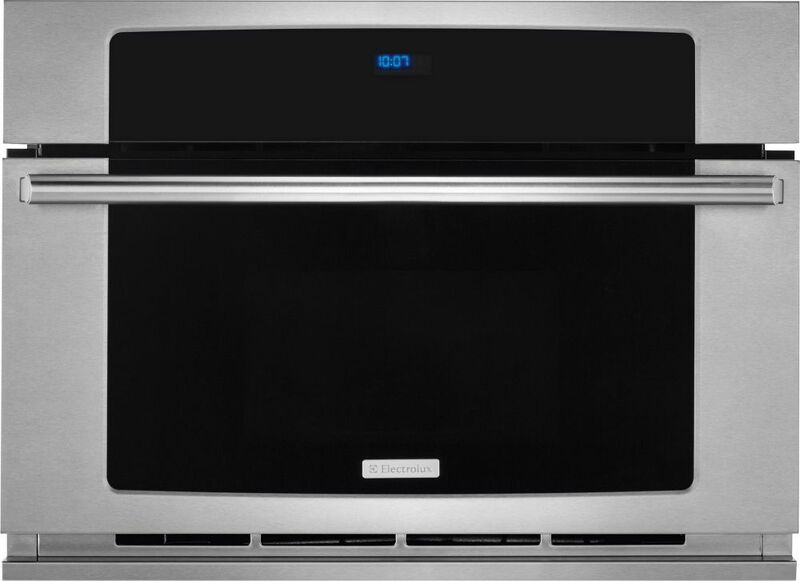 Rated 5 out of 5 by JohnD from Cool, Spacious, easy to use & kid friendly I bought the Electrolux 30" Built-In Convection Microwave Oven with Drop-Down Door in December 2018 and have been using it since. Super cool looking as a built in wall unit, lots of space on the inside for larger dishes. Kids find it easy to use and especially love the multiple features available on the microwave. We especially like the large ceramic turntable, as compared to glass transparent ones from GE that we have been using for the last 15 years, as it looks and feels a lot stronger and durable. The drop down door is an extremely using feature that we use a lot a a stand for holding dishes, as we are switching dishes in and out of the microwave. We use the "fast recipes", "Fast Features" and "Auto Cook" all the time. Extremely useful and great looking microwave from Electrolux. Rated 4 out of 5 by act005 from Good combo Great space saving design and tons of features. At 900W, the microwave is a little underpowered for what we've been used to, but something you can adjust for. Rated 1 out of 5 by Oldgal from 2 microwaves and 4 repairs sobfar This microwave came with our new home. We have been here since Novembervand still don’t have a working microwave. First they blamed the builder and the electrical system. Then said the motherboard was bad. That was replaced and did not work out of the box! Then the builder gave me a new microwave. Same problem. Currently a New mother board for that is on order. I have asked for a new model but am forced to try yet another mother board. Rated 5 out of 5 by Waydecar from Beautiful and easy to ise It’s the perfect added feature to my kitchen. It really stands out because of its many features and look. Very easy to use. Rated 5 out of 5 by Northlake home from It looks great in the space, I haven't used it much yet but it's very easy to use so far. Rated 4 out of 5 by Gigi P from Love the Options of Convection and Microwave I like having the option of having a microwave and a convection oven. I used the convection oven to make corn bread. It was the best I’ve ever cooked in a conventional oven. And it was so evenly cooked and pretty. However, I find the microwave controls a a bit confusing and not that easy to operate.